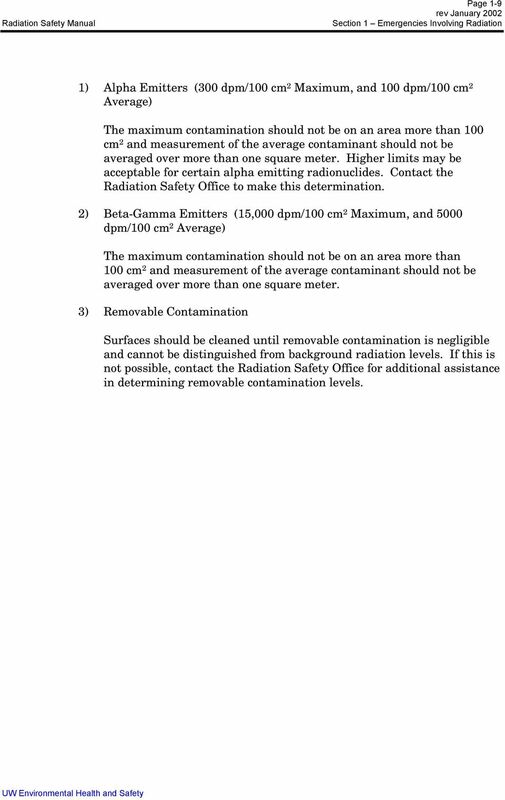 2 Page 1-2 Radiation Safety Manual b. Prevent the Spread c. Shield the Source d. Close the Room e. Call for Help Minor Spills (Spills less than major spill quantities) a. Notification b. Prevent the Spread c. Clean-Up d. Survey e. Report Decontamination Procedures a. Prevent Spread of Contamination b. 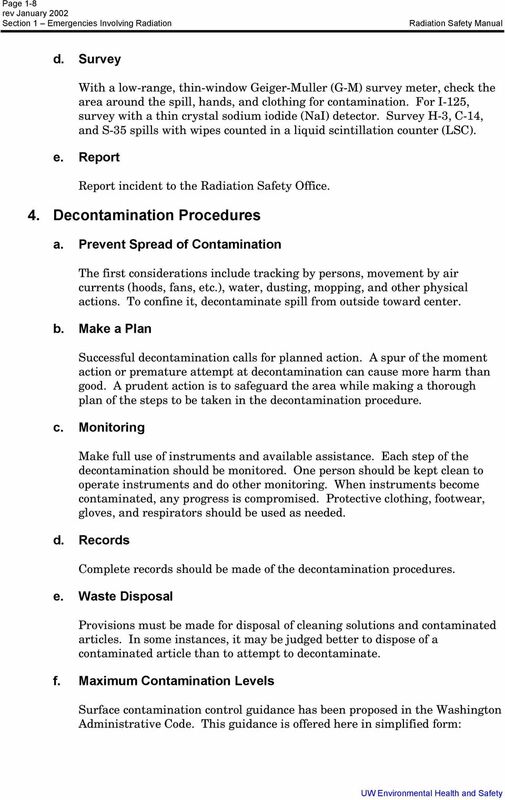 Make a Plan c. Monitoring d. Records e. Waste Disposal f. Maximum Contamination Levels Tables Table 1-1 Radionuclides in Use (ALI = Annual Limit on Intake) The following information is general immediate guidance for radiation accidents and emergencies. A. Emergency Phone Numbers 1. Campus a. Radiation Safety Office b. University Police Off Campus a. Radiation Safety Office...(206) b. After hours, call University Police...(206) ) Ask them to call "Staff on Call". 2) Give them your name and number. 3) Someone will call you back. 3 Page 1-3 B. Personal Injury The primary concern is care of the injured person. 1. Medical Help Seek medical attention and inform the attendants as completely as possible regarding the incident. Someone knowledgeable should accompany the individual if they are transferred to another location for medical treatment. 2. Injury with Radiation Contamination If the accident involves radioactive materials, there may be potential for the spread of contamination. Avoid spread of contamination as much as possible when treating the individual. However, contamination control must be considered secondary to medical care. 3. 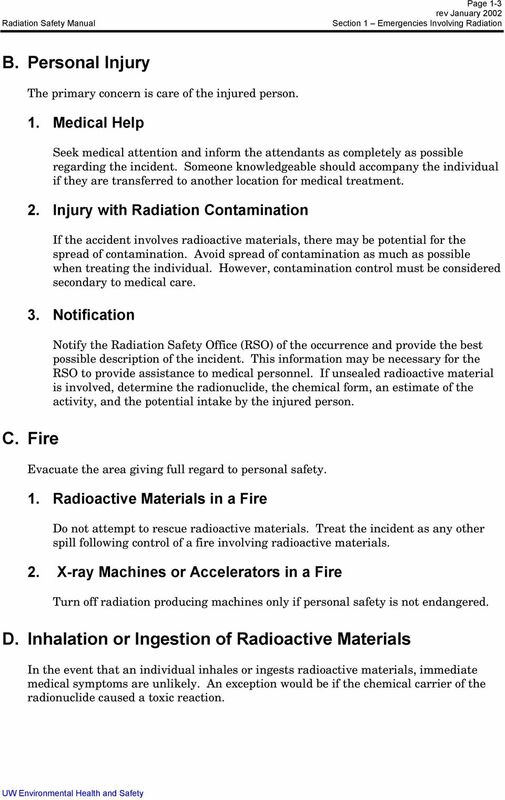 Notification C. Fire Notify the Radiation Safety Office (RSO) of the occurrence and provide the best possible description of the incident. This information may be necessary for the RSO to provide assistance to medical personnel. If unsealed radioactive material is involved, determine the radionuclide, the chemical form, an estimate of the activity, and the potential intake by the injured person. Evacuate the area giving full regard to personal safety. 1. Radioactive Materials in a Fire Do not attempt to rescue radioactive materials. Treat the incident as any other spill following control of a fire involving radioactive materials. 2. X-ray Machines or Accelerators in a Fire Turn off radiation producing machines only if personal safety is not endangered. D. Inhalation or Ingestion of Radioactive Materials In the event that an individual inhales or ingests radioactive materials, immediate medical symptoms are unlikely. An exception would be if the chemical carrier of the radionuclide caused a toxic reaction. 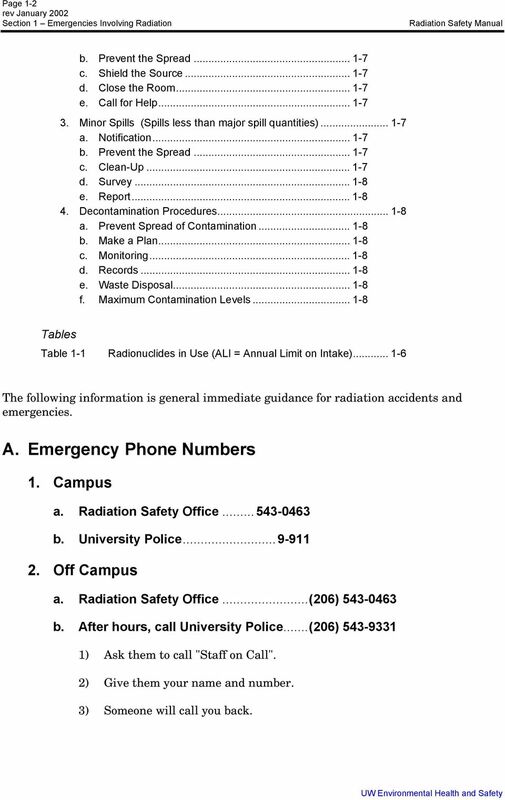 4 Page 1-4 Radiation Safety Manual 1. Medical Attention If the individual experiences nausea, discomfort of the mucous membranes, or other acute reactions, seek medical attention. Sometimes drinking large quantities of liquids can relieve symptoms and also dilutes activity. The need to induce vomiting or other purging procedures should be determined by a physician. RSO evaluation of intake information may be helpful to medical professionals. 2. Intake Evaluation An attempt should be made by individuals at the site of the incident to determine the radionuclide involved, the chemical form, and an estimate of the amount inhaled or ingested. This information may be needed by an attending physician, but must also be given to the RSO for dose evaluation. 3. Dosimetry The RSO will make an initial evaluation of the radiation dose resulting from the inhalation or ingestion event. This information may be provided to the individual or their physician, to evaluate the need for further medical response. In nearly all situations, medical intervention is not necessary due to the radioactivity alone. 4. Bioassay Biosampling and subsequent bioassays may be necessary to refine the dosimetry estimates. Biosampling usually consists of collecting urine or feces. E. Exposure to X-ray Machines, Accelerators or Large Gamma Sources It is extremely unlikely that anyone would experience immediate medical symptoms from x-ray machine, accelerator or gamma source exposure. Individuals suspecting over-exposure must contact: 1) the RSO to evaluate the dose, and 2) a physician for medical follow-up. 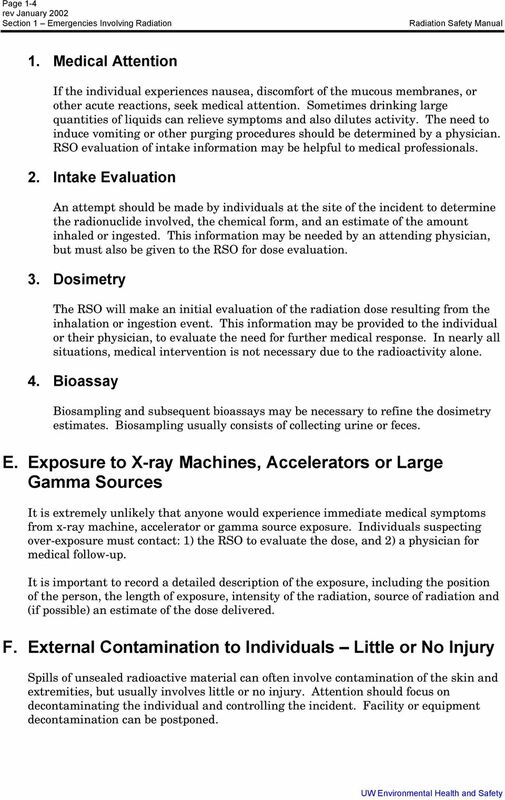 It is important to record a detailed description of the exposure, including the position of the person, the length of exposure, intensity of the radiation, source of radiation and (if possible) an estimate of the dose delivered. F. External Contamination to Individuals Little or No Injury Spills of unsealed radioactive material can often involve contamination of the skin and extremities, but usually involves little or no injury. Attention should focus on decontaminating the individual and controlling the incident. Facility or equipment decontamination can be postponed. 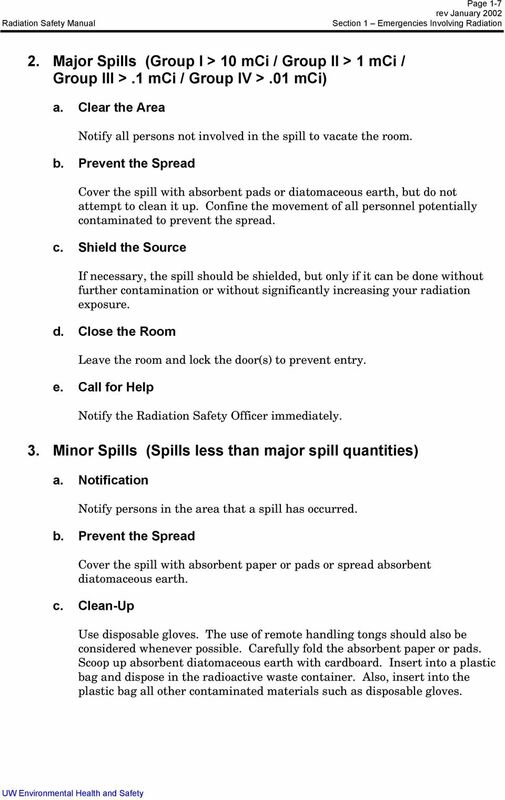 5 Page Controlling Incident If possible, take steps to limit the spill and control access to the area. 2. Personal Decontamination a. Protect the Eyes Eye contamination presents a special case and the eyes should be washed with copious amounts of warm water only. 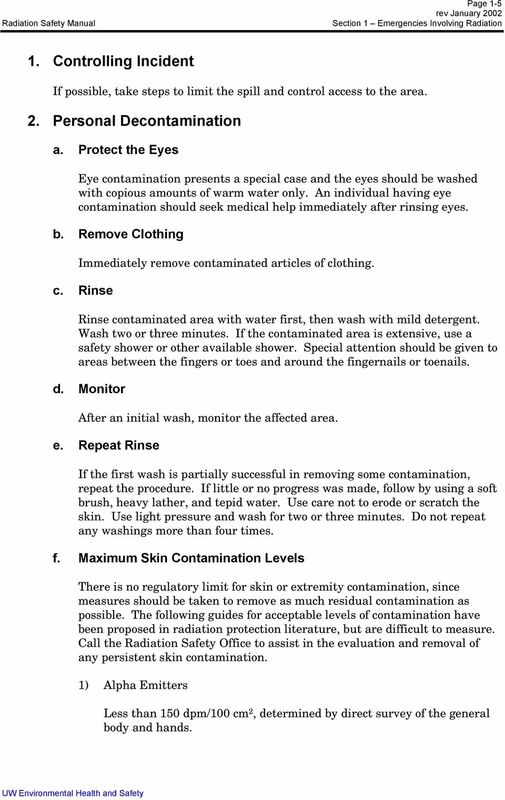 An individual having eye contamination should seek medical help immediately after rinsing eyes. b. Remove Clothing Immediately remove contaminated articles of clothing. c. Rinse Rinse contaminated area with water first, then wash with mild detergent. Wash two or three minutes. If the contaminated area is extensive, use a safety shower or other available shower. Special attention should be given to areas between the fingers or toes and around the fingernails or toenails. d. Monitor After an initial wash, monitor the affected area. e. Repeat Rinse If the first wash is partially successful in removing some contamination, repeat the procedure. If little or no progress was made, follow by using a soft brush, heavy lather, and tepid water. Use care not to erode or scratch the skin. Use light pressure and wash for two or three minutes. Do not repeat any washings more than four times. f. Maximum Skin Contamination Levels There is no regulatory limit for skin or extremity contamination, since measures should be taken to remove as much residual contamination as possible. 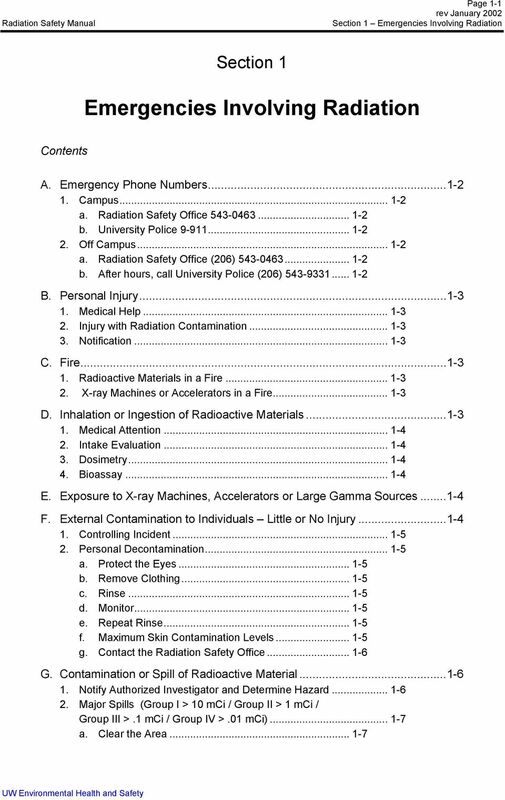 The following guides for acceptable levels of contamination have been proposed in radiation protection literature, but are difficult to measure. Call the Radiation Safety Office to assist in the evaluation and removal of any persistent skin contamination. 1) Alpha Emitters Less than 150 dpm/100 cm 2, determined by direct survey of the general body and hands. 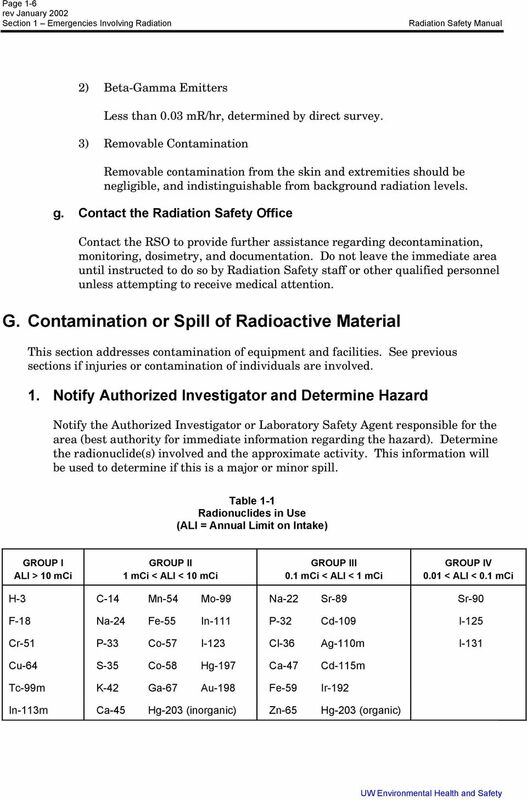 7 Page Major Spills (Group I > 10 mci / Group II > 1 mci / Group III >.1 mci / Group IV >.01 mci) a. Clear the Area Notify all persons not involved in the spill to vacate the room. b. Prevent the Spread Cover the spill with absorbent pads or diatomaceous earth, but do not attempt to clean it up. Confine the movement of all personnel potentially contaminated to prevent the spread. c. Shield the Source If necessary, the spill should be shielded, but only if it can be done without further contamination or without significantly increasing your radiation exposure. d. Close the Room Leave the room and lock the door(s) to prevent entry. e. Call for Help Notify the Radiation Safety Officer immediately. 3. Minor Spills (Spills less than major spill quantities) a. Notification Notify persons in the area that a spill has occurred. b. Prevent the Spread Cover the spill with absorbent paper or pads or spread absorbent diatomaceous earth. c. Clean-Up Use disposable gloves. The use of remote handling tongs should also be considered whenever possible. Carefully fold the absorbent paper or pads. Scoop up absorbent diatomaceous earth with cardboard. Insert into a plastic bag and dispose in the radioactive waste container. Also, insert into the plastic bag all other contaminated materials such as disposable gloves. 9 Page 1-9 1) Alpha Emitters (300 dpm/100 cm 2 Maximum, and 100 dpm/100 cm 2 Average) The maximum contamination should not be on an area more than 100 cm 2 and measurement of the average contaminant should not be averaged over more than one square meter. Higher limits may be acceptable for certain alpha emitting radionuclides. Contact the Radiation Safety Office to make this determination. 2) Beta-Gamma Emitters (15,000 dpm/100 cm 2 Maximum, and 5000 dpm/100 cm 2 Average) The maximum contamination should not be on an area more than 100 cm 2 and measurement of the average contaminant should not be averaged over more than one square meter. 3) Removable Contamination Surfaces should be cleaned until removable contamination is negligible and cannot be distinguished from background radiation levels. If this is not possible, contact the Radiation Safety Office for additional assistance in determining removable contamination levels. 2. HAZARDS IDENTIFICATION Contact with combustible material may cause fire. Causes severe burns. CLASSIFICATION C;R35. O;R8. Concentrated NITRIC ACID MSDS Nitric Acid 98% 1. IDENTIFICATION OF THE SUBSTANCE PRODUCT NAME Nitric Acid 98% 2. HAZARDS IDENTIFICATION Contact with combustible material may cause fire. Causes severe burns. Spill Clean-up. Flammable Liquids Liquids with flash points below 100 degrees Fahrenheit.